A plasma is a partially ionized gas. Plasmas can be separated into two categories: thermal and non-thermal. Thermal or ‘hot’ plasmas such as a spark or arc are commonly used for ignition in many engine applications (e.g. spark plugs) with the main advantage being the highly localized, very high gas temperatures. Non-thermal or ‘cold’ plasmas such as glow discharges and dielectric-barrier discharges (e.g. plasma display panels) are used in chemical excitation processes through volumetric generation of excited species, radicals and ions. Our plasmas are typically thermal and are generated by high voltage sources (up to 20kV). These plasmas have short lifetimes, measured in the 100’s of nanoseconds and are repeated at up to kHz rates. One advantage of introducing plasmas to a combustion process is the fuel can be made more reactive or diffusive and can allow combustion processes to run in conditions and at speeds at which they are usually unstable. Possible applications of these plasmas include the use of lean fuel mixtures in order to reduce emission of pollutants (particularly NOx) and increased combustion stability. Figure 1. Example of a non-thermal, plasma-based ignition source. Our studies are focused on examining both sides of the combustion issue; fluidic and chemical effects. Both of these effects can be observed in the above image. A large number of radicals produced in the plasma filament due to the high levels of electrical energy deposited in the flame. These electrically generated radicals can have a very large effect on overall combustion performance depending on the location of the radical generation. Flame fluidics are affected due to the rapid heating of the gas causing a shockwave that the flame also reacts to. Again, depending on the location of generation, this fluidic perturbation can have a large positive effect on the combustion process. Figure 2. Broadband emission movie taken at 2 kHz showing fluidic response to a 1 kHz pulsed plasma. CnHm+e → CnHm-1+H+e, where a chain propagation reaction H+ O2 ↔ OH+O can be initiated at lower gas temperature compared to thermal equilibrium kinetics. CnH2n+2+e → CnH2n+1+H+e, CnH2n+1 is unstable leads to CnH2n-1+CH3+H+e. HO2 kinetics can potentially be modified by electron impact. With such a wide variety of chemical reactions, understanding the chemical kinetics is highly important. For these conditions we use planar fluorescence or chemiluminescence studies to look at spatial distribution of important radicals such as NO, OH, CH, etc. An example of these planar fluorescence studies can be seen in figure below. Figure 3. 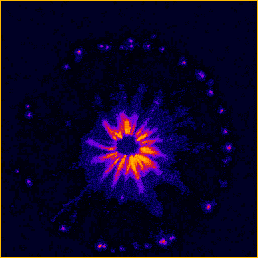 Typical OH planar laser-induced fluorescence image of a premixed flame with a +5 kV discharge just outside the reaction zone. Note the stronger emission in the plasma filament and the movement of the flame away from the discharge in response to a generated shockwave. (right) Species and temperature distribution in a premixed, laminar flame. Note the strong change in species and temperature in a very small distance. Retrieved from Combustion by I. Glassman and R. Yetter, Academic Press, New York 2008. Minimum density/densities of injected radicals required for propagating chain branching reactions at temperatures < 800 K in hydrocarbon/air combustion. Electrical power budget for minimum density/densities of injected radicals production. Pulsed power source requirements for efficient radical generation.